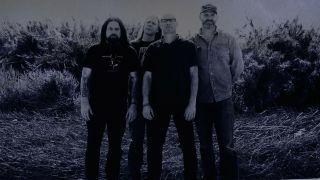 Goatsnake have released a stream of Grandpa Jones, taken from the band’s forthcoming album Black Age Blues, the follow-up to 2000’s Flower of Disease. Alongside Anderson (Sunn O))), vocalist Pete Stahl (Scream), drummer Greg Rogers (The Obsessed) and bassist Scott Renner, Black Age Blues features a guest appearance from Slint, Aerial M and Papa M guitarist David Pajo. The album was recorded and mixed at Rock Falcon Franklin, Tennessee by Nick Raskulinecz, who’s previously worked with the likes of Queens Of The Stone Age, Foo Fighters, Alice In Chains, Mastodon and Rush. Black Age Blues is released on Southern Lord Recordings on June 1, and preorders for the album are now live. Check out the preorder options at the new Goatsnake store, via BandCamp and iTunes. The band are currently on tour, and play Bristol’s Temple Festival on May 30.